Glór Inis Eoghain is up and running ! 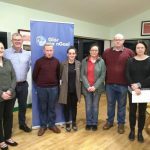 After organizing a public meeting in Carndonagh last Friday night, 29 March, a new 22 strong group has come together and have a committee elected. The next meeting will be held on 10 April at 19:30 at the Carndonagh GAA clubhouse. Everybody is welcome. Ar aghaidh linn!